KEY VERSE: "Then they returned from the tomb and announced all these things to the eleven and to all the others" (v.9). TO KNOW: Luke’s account of the discovery of the empty tomb follows Mark's narrative but adds the story of Peter’s visit to the tomb (known in a different form in John 20:3–8). In each Gospel, the actual event is unseen. The Evangelists only tell us what happened afterward. In Luke's Gospel, it is daybreak of the "first day of the week" (Sunday), the dawning of the first day of the new creation. Some women who followed Jesus from Galilee (Lk 23:55), came to the tomb to anoint Jesus body. They wondered who would roll away the heavy stone that had been rolled in front of the entrance of the tomb. When they arrived, they discovered that the stone was rolled away and the tomb was empty. God's messengers asked the women why they were seeking the "living one" (Luke 24:5) among the dead. Just as Jesus foretold, he had been raised from the dead. The women announced this good news to Jesus' disciples, but Peter, as the chief apostle, needed to confirm the story for himself. When he entered the tomb, he only saw the burial cloths; then he went home amazed at what had happened (v 12). TO LOVE: Have I experienced new life in Jesus? TO SERVE: Lord Jesus, "you conquered the power of death and opened for us the way to eternal life" (Opening Prayer). NOTE: Following an ancient tradition, the Church regards the eight days (an octave) from the Paschal Feast of the Resurrection to the Second Sunday of Easter as a single unit of celebration. The preface for Easter day is prayed again on the Second Sunday of Easter even though it is a week behind us: "We praise you with greater joy than ever on this Easter day." The celebration of the liturgy is full of joy at the close of the octave of this great feast! The Easter season of 50 days continues through the Seventh Sunday of Easter (Celebrated as the Solemnity of the Ascension of the Lord in some dioceses). KEY VERSE: "Do not be afraid. Go tell my brothers to go to Galilee, and there they will see me" (v. 10). TO KNOW: By the time Matthew wrote his gospel there was a dispute between the Jewish leaders and the followers of Jesus regarding the meaning of the empty tomb. The religious leaders believed Jesus' followers had stolen his body. Matthew maintained that the men had fled Jerusalem after Jesus' arrest (Matt 26:56); therefore they could not be guilty of stealing his body. The women were the only eye-witnesses of the empty tomb. When the women came to the tomb to anoint Jesus' body, they were commanded by an angelic messenger to inform the disciples that Jesus had been raised from the dead. They were afraid because a woman's testimony was not considered valid, yet they hastened to announce the joyful news that Jesus had risen. As they went on their way, the Risen Christ appeared to them and told them to have no fear. He would meet his disciples in Galilee. TO LOVE: Have I shared the good news of the Resurrection with someone who needs to hear it? TO SERVE: Risen Lord, help me to overcome my fears as I proclaim your gospel. EARTH DAY is observed each year by the United Nations and by people around the world acting as responsible trustees of the earth. All individuals and institutions have a mutual responsibility to act as guardians of the earth, seeking the choices in ecology, economics and ethics that will eliminate pollution, poverty and violence, foster peaceful progress, awaken the wonder of life, and realize the best potential for the future of humanity. KEY VERSE: "I have seen the Lord" (v.18). TO KNOW: When Peter and John heard the good news that Jesus had risen from the dead, they hurried to inspect the empty tomb for themselves. When they returned to their homes, Mary Magdalene was left alone in the garden, Fearing that someone had taken away Jesus' body, she wept. When the Risen Christ appeared to her, she mistook him for the gardener. In truth, he was the new Adam, the keeper of the garden of the new creation. Through her tears, Mary failed to recognize her Lord, but when he spoke her name, she knew that he was her "dear master" (Hebrew, Rabbouni, teacher). Jesus told her not to cling to him in the joy of her discovery. He had a mission for her, that of sharing the good news with his "brothers," the rest of his disciples. The Church regards Mary Magdalene as an "Apostle to the Apostles," the redeemed daughter of the Lord, the first to see the Risen Christ. TO LOVE: Do I give testimony of the Risen Christ to my brothers and sisters? TO SERVE: Risen Lord, help me to recognize you in all those around me. KEY VERSE: "Were not our hearts burning within us while he spoke to us on the way and opened the scriptures to us?" (v. 32). TO KNOW: On their way home from their pilgrimage for the Feast of Passover, two disciples discussed the meaning of the events that they witnessed in Jerusalem. As they walked along, the Risen Christ appeared to them. But they did not recognize him and mistook him for another pilgrim. They told the "stranger" that Jesus was a mighty "prophet" (v. 19). Jesus then opened the scriptures and explained to them God's plan as revealed in the Law and the Prophets (the Torah). Although they had lost hope that Jesus was the expected Messiah, the "one to redeem Israel" (v. 21), Jesus told them that it was "necessary" that he should suffer so as to enter glory (v. 26). At nightfall, the disciples urged him to stay and share a meal with them. At first their eyes were closed to Jesus' identity, but then they recognized him at table "in the breaking of the bread" (v. 35). Although Jesus vanished from sight, he continues to be present to us in the breaking of the word in the scriptures and the breaking of the bread in the Eucharist. TO LOVE: Only one disciple (Cleopas) is named in the story. Am I the other disciple? TO SERVE: Risen Lord, help me to recognize your presence in the Mass. NOTE: "Our Hearts Were Burning Within Us" is a Pastoral Plan for Adult Faith Formation in the United States from the United States Conference of Catholic Bishops (USCCB). The Bishops call "Every disciple of the Lord Jesus to share in this mission. To do their part, adult Catholics must be mature in faith and well equipped to share the Gospel, promoting it in every family circle, in every church gathering, in every place of work, and in every public forum. They must be women and men of prayer whose faith is alive and vital, grounded in a deep commitment to the person and message of Jesus." KEY VERSE: "He stood in their midst and said to them, `Peace be with you'" (v. 36). TO KNOW: After the two pilgrims from Emmaus recognized Jesus "in the breaking of the bread" (v. 35), they returned to Jerusalem to announce the good news of the resurrection to the eleven Apostles and those with them. But they discovered that Simon (Peter) had already experienced the risen Lord. Then the pilgrims recounted how their hearts burned within them on their journey to Emmaus, how Jesus opened the scriptures to them, and how he became known to them in the breaking of bread. While they were still speaking, Jesus appeared in their midst and imparted peace to his distressed followers. He reassured them that he was not a ghost by showing them the wounds of the crucifixion and by sharing a meal with them. He reminded them that he had told them that he would suffer, die and rise from the dead. Jesus declared that everything in the scriptures had been fulfilled by him. His followers were witnesses of these events, and were commanded to proclaim a message of "repentance for the forgiveness of sins" (v. 47). TO LOVE: In what ways do I bring the peace of Christ to those who are anxious and afraid? TO SERVE: Risen Lord, give me the courage to proclaim your resurrection. KEY VERSE: "It is the Lord!" (v.7). TO KNOW: After the resurrection, Peter and six other disciples went fishing. In the half-light of the morning, the Risen Christ called to them from the shore, telling them to cast their nets to the right side of the boat. Although they had fished all night and caught nothing, their obedience brought forth a great draught of fish. John was the first to understand the meaning of this sign and cried "It is the Lord!" Peter was the first to act, swimming and dragging the heavily laden net to shore. Although the net held a great catch of fish it was not torn. The unbroken net is a symbol of the future mission of the Church to bring all souls to Christ. St. Jerome claimed that the Greeks identified 153 species of fish in the sea. The miraculous catch included every kind of fish; therefore, the number symbolized the day when all of the nations would be gathered together in God's kingdom. When Jesus' disciples assembled on the shore, he shared a meal with them, distributing bread and fish just as he did in the miraculous multiplication of the loaves and fish in the wilderness (Jn 6:1-13). The Risen Christ was not a vision or a spirit, nor was he a ghost. He was the Lord who conquered sin and death through his dying and rising. TO LOVE: Do I allow the Lord to direct me despite doubts as to the outcome? KEY VERSE: "Go into the whole world and proclaim the Gospel to every creature" (v 15). TO KNOW: This section of Mark's Gospel (verses 9-20) is termed the "Longer Ending." It is believed that this material was added later from other traditions to complete what was thought to be an abrupt ending of the empty tomb in Mark's gospel. The longer version includes Christ's appearance to Mary Magdalene (Jn 20:1-18), and to two disciples on a country road to Emmaus (Lk 24:13-24). The disciples did not believe any of these witnesses, and later, when they "were at table" (v 14, Eucharist), the Lord appeared to them and rebuked them for their unbelief. Jesus then commissioned his followers to go into the world and proclaim the message of salvation to everyone. But Mark's purpose in writing was complete; Jesus was raised from the dead just as he told his followers. Mark's message was a warning to the Christian community to be fearless in announcing the gospel of Jesus. Mark’s original ending leaves his readers to “complete” his Gospel by the way they live their lives. TO LOVE: Have I the courage to share the good news with those who do not believe? TO SERVE: Risen Lord, help me to believe that you are with us always. KEY VERSE: "Blessed are those who have not seen and have believed" (v.29). TO KNOW: On the evening of the resurrection, the disciples were gathered in fear behind locked doors. They were overjoyed when the Risen Lord appeared in their midst with a greeting of "peace" (Hebrew, Shalom). Just as God breathed life into Adam, the first living being (Gn 2:7), the Son of God breathed the life-giving Spirit upon his disciples, sending them forth with the power to forgive sins. Thomas (called Didymus, meaning “twin”) was absent on this occasion and he refused to believe their testimony. His defiant words "unless I see" (Jn 20:25) came from one who knew Jesus as an intimate friend. A week later, the Risen Christ appeared again, and this time Thomas was present. When Thomas touched Christ's wounds, he declared Jesus to be his "Lord and God." Jesus told Thomas that those who believed in faith were more blessed than those who needed visible proof. TO LOVE: Am I Thomas’ twin? Do I refuse to believe unless I see? TO SERVE: My Lord and my God, help me to believe when my faith wavers. Sr. Faustina Kowalska, a Polish nun, was God’s instrument to proclaim Divine mercy toward every human being. Sr. Faustina was inspired by a vision in which Jesus told her that a painting should be made of his image with the invocation "Jesus, I trust in you." She commissioned the painting in 1935. Cardinal Karol Wojtyla, then Archbishop of Krakow (later St. Pope John Paul II), began Sr. Faustina's process of beatification. At her canonization in 2000, the first saint in the new millennium, the Pope designated the Second Sunday of Easter to be Divine Mercy Sunday. The Pope's final days coincided with the Church's preparation to celebrate the feast he described as flowing from Christ's "most profound mercy," and which the Lord himself established. 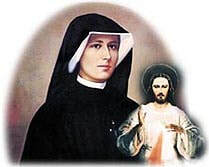 Today, we continue to rely of St. Faustina as a constant reminder of the message to trust in Jesus' endless mercy, and to live life mercifully toward others. For recitation on a chaplet or ordinary rosary beads, begin with the Sign of the Cross. Continue by saying one Our Father, one Hail Mary, and the Apostles Creed. Then on the OUR FATHER bead say the following words: "Eternal Father, I offer You the Body and Blood, Soul and Divinity of Your dearly beloved Son, Our Lord Jesus Christ, in atonement for our sins and those of the whole world." On the 10 HAIL MARY beads say: "For the sake of His sorrowful Passion, have mercy on us and on the whole world." Continue around the chaplet. In conclusion recite these words three times: "Holy God, Holy Mighty One, Holy Immortal One, have mercy on us and on the whole world." End with the Sign of the Cross. KEY VERSE: "No one can enter the kingdom of God without being born of water and Spirit" (v.5). TO KNOW: Nicodemus was a Pharisee, a member of the Sanhedrin (the Jewish council), and one of the Jerusalem aristocracy. Nicodemus was curious about Jesus but he was afraid to come to him in broad daylight, so he came to him at night. Jesus told him that it was not enough to claim membership of the chosen people. To become a child of God, one must be "born from above" (John 3:3). Nicodemus misinterpreted this to mean human birth. Jesus helped him to understand that he could only enter God's kingdom through spiritual rebirth in Baptism, being born of "water and Spirit." Although the workings of the Spirit were invisible, like the wind, anyone could observe the results. Nicodemus' spiritual growth was seen later when he courageously defended Jesus before the Sanhedrin (7:50), and when he came to anoint Jesus' body for burial (19:39). TO LOVE: Am I seeking to learn more about Jesus? KEY VERSE: "Do not be amazed that I told you, `You must be born from above'" (v.7). TO KNOW: Nicodemus was a respected teacher in the Jewish community (Jn 3:10), but without the grace of the Spirit given in Baptism, he failed to fathom the mystery of spiritual rebirth. Jesus compared the dynamics of the Spirit with the mysterious movement of the wind. In both Hebrew and Greek, there is one word for both "wind" and "spirit" (Hebrew, ruah, Greek, pneuma). One can observe the effects of the wind without knowing its origin or destination. Likewise, although one can see the result of grace within an individual, no one is fully able to comprehend the action of the Spirit. Jesus was the authentic witness of these "heavenly things," which would be fully known when he was exalted on the cross (19:30). TO LOVE: How can I help someone to be open to the Spirit in his or her life? TO SERVE: Risen Lord, breathe your life into me. KEY VERSE: "For God so loved the world that he gave his only Son, so that everyone who believes in him may not perish but may have eternal life" (v.16). TO KNOW: John 3:16 is often called the essence of the gospel. This text tells us that the Father sent the Son out of love for the world. God did not send his Son to condemn the world but to save it (v.17). When the Pharisee Nicodemus came to Jesus at night, Jesus told him that God sent him to save the world from sin and death. Everyone has the opportunity to respond to Jesus by acknowledging him as their Savior. Those who refuse to come into the light do so out of fear that their evil deeds might be exposed. God's verdict has already been pronounced upon those who "prefer darkness to light" (v.19). They bring condemnation upon themselves for their refusal to believe. But those who believe in God's Son should have no fear of the light. Although there was judgment, there was mercy. We have the indwelling Spirit to guide us so that our deeds will be done according to God's truth. TO LOVE: Do I help enlighten those who are in the darkness of unbelief? TO SERVE: Risen Lord, banish any darkness from my soul. KEY VERSE: "Whoever has accepted his testimony has certified this, that God is true" (v.33). TO KNOW: The Gospel of John continually contrasts the radical difference between salvation in Christ and the workings of the Evil One. Jesus brought light into the world, while the Evil One brought darkness. Jesus followers believed in him, while the unbelievers refused to listen to his words. Jesus was the one from the heavenly world "above" whom God sent to the world "below" (this description is theological, not geographical). The Son shares the fullness of the Spirit with the Father, who withheld nothing from him. The Son in turn imparts the Spirit to his followers. Throughout salvation history, God gave partial revelation to God's people; God was fully revealed through the Son who "spoke the words of God" (v.34). Whoever accepts this revelation receives eternal life; those who reject this gift bring God's judgment upon themselves. TO LOVE: Do I give thanks for the Divine gift of God's Son? TO SERVE: Risen Lord, help me to listen to your words so that I might know how to act in truth. Athanasius was born in Alexandria, Egypt, towards the end of the third century, and from his youth was pious and deeply versed in the sacred writings. While still a deacon, he was chosen by Alexander, his bishop, to go with him to the Council of Nicea, A.D. 325. There Athanasius defended the Church against the Arian heresy, which denied the Divinity of Christ. When Alexander was dying, he recommended Athanasius to be his successor as Patriarch of Alexandria, and he served in that office for forty-six years. When the dispute over Arianism spilled over from theology to politics, Athanasius was exiled five times, and spent more than a third of his episcopate in exile. He is a biographer of Saint Anthony the Abbot, a Confessor of the faith and Doctor of the Church. Philip was born in Bethsaida, Galilee, and may have been a disciple of Saint John the Baptist. Philip was called by Jesus (Jn 1:43-48) on the day after Peter and Andrew were called. 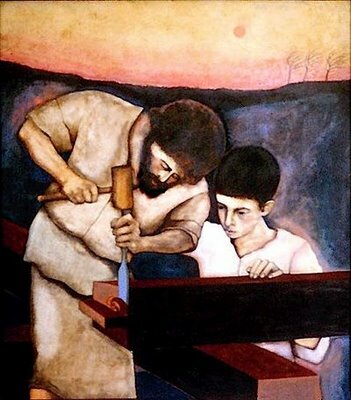 Philip began his evangelizing efforts by bringing Nathaniel (Bartholomew) to Jesus. When Nathaniel asked, "Can anything good come from Nazareth?" Philip replied: "Come and see" (1:43). Philip was present at the miracle of the loaves and fishes (6:1-15), and was the Apostle approached by the Hellenistic Jews from Bethsaida to introduce them to Jesus (12:21ff). Just before the Passion, Jesus answered Philip's query to show them the Father (14:8ff), but no further mention of Philip is made in the New Testament beyond his listing among the apostles awaiting the Holy Spirit in the Upper Room (Acts 1:13). According to tradition, Philip preached in Greece and was crucified at Hierapolis in Phrygia under Emperor Domitian, c. 80 AD. The names "James the Less" or "James the Younger" is usually applied to James the son of Alphaeus (Mk 15:40), Bishop of Jerusalem. He was favored by an appearance of the Risen Christ (I Cor 15:7).. He was visited by Saint Paul (Gal 1:19), and spoke at the meeting of the Apostles in Jerusalem (Acts 15:13). A tradition said that when James was 96 years old and had governed the Church for 30 years, he was challenged by his enemies to deny the Divinity of Christ. When he refused, he was cast down from the terrace of the temple and clubbed to death. The Breviary contains a very moving description of his death. "As he lay there half dead, with legs broken by the fall, he lifted his hands toward heaven and prayed to God for the salvation of his enemies, saying: ‘Lord, forgive them for they know not what they do!’ While the Apostle was still praying, a fuller struck his head a mortal blow." His relics now rest next to those of Saint Philip in the church of the Holy Apostles in Rome, and their names are mentioned in the first list in the Canon of the Mass. KEY VERSE: "It is I. Do not be afraid" (v.20). TO KNOW: After the miraculous multiplication of loaves in the wilderness, Jesus' disciples sailed to the village of Capernaum on the north shore of the Sea of Galilee (Lake Tiberius, named for the second Roman Emperor). It was Passover time, the time of the full moon (Jn 6:4), and Jesus was up on the hillside praying. When a sudden storm came up threatening to capsize the small craft of his terrified disciples, Jesus appeared walking on the water toward them, calming them with his divine presence, and bringing them safely to shore. Just as the spirit of God hovered over the waters at the beginning of creation, so Jesus hovers over them now. Whether in hunger or distress, Jesus continues to be with his people to deliver them from all evil. TO LOVE: How can I be a source of peace to someone who is fearful? TO SERVE: Risen Lord, help me to know that you are with me in all the storms of my life. TO KNOW: After the resurrection, Jesus revealed himself once again on the Sea of Galilee ("Tiberias," Jn 6:1). In the half-light of the morning, he called to his followers from the shore, telling them to cast their nets to the right side of the boat. Although they had fished all night and caught nothing, their obedience to Jesus brought forth a great number of fish. John was the first to understand the meaning of this sign and cried out, "It is the Lord!" Peter was the first to act, swimming and dragging the heavily laden net to shore. Although the net held a great catch of fish it was not torn. The unbroken net was a symbol of the future mission of the Church to bring souls to Christ. Afterwards, Peter was given a three-fold opportunity to publicly profess his devotion in reparation for his three denials. For each declaration of faith, the Risen Lord commanded Peter to feed the flock, the Christian community. Peter, the Church's future shepherd, would lay down his life for the sake of the flock as Jesus did. TO LOVE: Am I willing to feed the flock the Lord has given me? TO SERVE: Risen Lord, give me the grace to declare my faith in you before others.